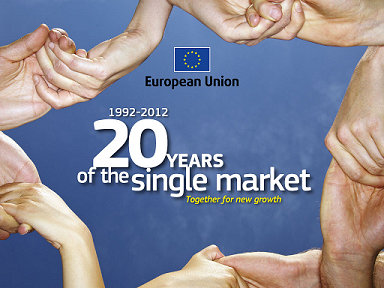 The EU is celebrating the 20th anniversary of the single market with a series of events throughout Europe during Single Market Week 15-19 October. This was launched in Brussels on 15 October at the European Parliament with a high-level event at which CEPI was represented. CEPI congratulates the EU on the achievements of the single market, but this anniversary is also a reminder that there are many outstanding challenges to be addressed. European Commission President José Manuel Barroso stressed the importance of the single market for growth and called upon EU Member States to adopt quickly the outstanding measures included in the framework of the Single Market Act. One important such measure is the modernisation of the Directive on the Recognition of Professional Qualifications, which remains under discussion at the European Parliament and European Council and is not now likely to be adopted before the end of this year. As well as statements by the President of the Italian Council Mario Monti and Commissioner Barnier, on his own behalf and also on behalf of former Commission President Jacques Delors, the event included two interactive work panels on which consumer and business organisations were represented together with the European Commission and the European Parliament. The Cypriot Presidency was also represented on the panels. The audience was first informed as to the progress which has been made in significant areas of the single market, such as increased mobility of citizens, more rights for passengers, easier cross-border trade and services, cheaper phone calls abroad, better protection for consumers etc. The first interactive work panel focused on the achievements of the single market, although concerns were expressed on behalf of consumers and SMEs that not all expectations have yet been met. Testimonials were also given from the floor as to personal experiences with the single market. Whilst much of what was said was positive, frustration was expressed with the difficulties which continue to be experienced in the recognition of qualifications, particularly in terms of the complexity and length of the procedure. The second work panel focused on the challenges of the single market and potential ideas for improvement. Calls were made for a single market conducive to business and work, but also with a focus on consumers, a deeper internal market with quicker progress on the digital single market and the completion of the energy market. Implementation and enforcement of existing regulations were seen as important and concern was expressed about protectionist measures which can pose a threat to the single market. Commissioner Barnier referred to the smart regulation agenda and called for a “bottom-up” approach gathering new ideas from throughout the EU as to how to meet these challenges. Overall the single market is seen as being a vital element for economic recovery, together with social cohesion and innovation. Whilst much has been put in place at European level by way of legislation the single market itself remains a work in progress. In considering how to meet the outstanding challenges CEPI encourages the EU legislator to pay strong attention to the importance of the real estate sector in the European economy and the need for quality professional services in this sector, as well as to encouraging greater mobility of cross-border services. Among the four fundamental freedoms "free movement of people, goods, capitals and services", the last one remains the most difficult one to implement. Deregulation of services at national level is presented as the best possible instrument to boost service provision at European level. Risk management is given special attention as well. Health and security are perceived as representing risks that call for harmonised regulation and protection, and financial services today benefit from full attention in that Member States largely recognize the importance of common rules to get out of the debt crisis soon. CEPI estimates that careful and minimum harmonization might be an efficient tool to boost service sectors such as the real estate one, when weighing on the economy and being perceived as representing risks to both the service providers and consumers.